The Democratic Organization of Iranian Women, Iran’s largest progressive women’s organization, was founded on 18th February 1943, by a group of women activists from the ranks of the Tudeh Party of Iran. It started life, originally, as “Women’s Organization of Iran” (Tashkilat-e-Zanan-e Iran) under the leadership of Maryam Firooz, and with the efforts of women political activists such as Badri Alavi, , Najmi Alavi, Zahra Eskandari, Mehrangiz Eskandari, Jamileh Sedighi, Khadijeh Keshavarz, Akhtar Kambakhsh, Iran Arani, Faroohid Kabbari, Alyeh Sharmini and Homa Houshmand Rad among others. The need for establishing a progressive women’s organization arose out of conditions pervading our country in which most of the women’s progressive associations and publications that had emerged following the Constitutional Revolution in 1905 were being closed down and suppressed by the regime of Reza Khan, targeted by the hatred of reactionary and closed-minded clergy. Under Reza Khan’s dictatorship only the “Women’s Club” (Kanoon-e Banovan) – a charity – was permitted activity, with a role limited to promoting the policies of the monarchy, charitable work, and matters such as home-making, child rearing and cooking, and keeping away from the country’s political life. Reza Khan’s compulsory ban on the veil (hejab) was perpetrated as an act of violence against women. While it was publicised as women’s “liberation” by the Pahlavi regime, it had an agenda other than the participation of women in the country’s political and social life, in a patriarchal society, while illiteracy was rife among women and their most basic rights were denied them. The truth is that Iran’s nascent and dependent capitalism had reached a stage at which it was in desperate need of cheap labour which women could provide. Reza Khan did not believe in women’s liberation. He had several wives at the time, and it was on his orders that women’s progressive organizations were banned and their activists imprisoned. His order for the forced ‘unveiling’ of women should be viewed in this context. As the late Ehsan Tabari, our country’s renowned thinker, wrote in his book “Iranian Society in Reza Shah’s Time”, during his reign, while the ‘the Iranian peasant was forced to forego his felted hat in favour of [the Western] cap, or as the chador (veil) was pulled, by force, from the head of old women in public squares, and dozens of violent acts of this type were carried out’ there was no ‘serious struggle against illiteracy, opium addiction, and poor public health’. Reza Shah’s brutal action against women was more a dramatic attempt to conceal the bitter realities of the Iranian society, foremost the high illiteracy among women and their lack of rights in the political, social and civil arenas, than an act of liberation. There was no serious action against the prevailing problems, and moreover progressive women who fought for these rights were put in imprison. With the expansion of an emerging dependent capitalism in Iran, women’s labour force expanded into arenas other than the traditional agriculture, carpet weaving and handicrafts, into nursing, industry, factories and workshops, and women gradually became more involved in administrative services, health and education. However, these developments were not accompanied by the provision of welfare and legal support both in the field of work and in political and civil arenas – such as the right to vote and better pay – something that women had achieved through their struggle, in many countries of the world. As the world grappled with World War II and as fascism became a serious threat, peace-loving people the world over began a widespread campaign against war. The founding of the Women’s Organizations of Iran (Tashkilat-e Zanan-e Iran) was a response to the need to pursue these goals, ones that were well understood by progressive women in Iran. In the short breathing space that was created after Reza Khan’s scandalous fleeing of the country on the orders of the British government, and the installing of his son on the thrown, progressive associations, trade unions, and peasants’ guilds formed one after another, taking advantage of the conditions. Women’s Organization of Iran led by Maryam Firouz began its activities during this time, and through the steadfast and day-to-day work of its members and cadres, succeeded in organising women around demands for equal rights, the right to vote, abolishing reactionary laws, for peace, equal pay and for literacy for girls and women, and promotion of gender awareness in society. The Organisation worked among women, holding local meetings and weekly conferences, organising literacy, sewing, and health classes and giving assistance to people in deprived areas, setting up organizations such as the Union of Working Class Women, the Mothers’ Council, the Association of Peace Supporters, Society for the Protection of the Child, and helped raise gender awareness. “Our Awakening” (Bidari-e-Ma, 1944), the first organ (journal) of the Democratic Organization of Iranian Women (with Zahra Eskandari as its proprietor), with the by-line “We, too, have rights in this house” familiarized women with their rights at home and in society. In 1947 Mohammad Reza Shah ordered it to be closed down. Subsequently, other publications such as “Shining World” (Jahan-e-Taban, 1947) and “Women’s World” (1951), which publicised the demands of women, entered the scene at the time. In 1946, Women’s Organization of Iran became a member of the Women’s International Democratic Federation (WIDF) – the largest international women’s organization, which initiated World Conferences of the United Nations, and which saw through the adoption of resolutions that have contributed greatly to the global women’s movement and its achievements. Women’s Organisation of Iran was renamed the Democratic Organization of Iranian Women in the same year. 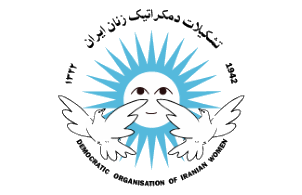 In February 1949, when the state declared illegal the Tudeh Party of Iran and democratic and mass organisations, many activists of these organizations were prosecuted and sentenced to long term imprisonment. Among these was the Democratic Organization of Iranian Women. Activists of the organization, across Iran, were forced underground. During this period, they published two clandestine publications for women and girls separately. In 1950, the executive committee of the organization started a new publication entitled “Shining World” (Jahan-e-Taban) with the slogans “Equal Rights for Women and Men” and “For the preservation of peace and the defense of children’s rights”. Since the organization was declared illegal and could not have open activity and reach the large majority of women, a new organization was founded by a number of DOIW’s leading members, and called “Women’s Organization” (Sazeman-e- Zanan). On May 30, 1951, with the help of the editorial board of “Women’s World” (Jahan-e-Zanan) and with the participation and cooperation of a number of progressive women, a major conference was held in Tehran and the “Women’s Organization of Iran” announced its re-launch. The organization established its own clubs in Tehran and other cities, and embarked on promoting greater awareness in women of their legal rights, it set up libraries and sports clubs for girls and women, and organised teaching literacy as well as classes in foreign languages, sewing, and other skills. “The council of the university should give a positive response to the demands of the heroic students of Tehran”. In the throes of the adoption of the new constitutional law in Iran, the Women’s Organization of Iran began a massive campaign for reforms, promoting the importance of women’s participation in the parliamentary elections and set about collecting signatures. In this regard, it sent letters to the renowned statesmen in the country such as Ali Akbar Dehkhoda, who offerred his approval and co-operation, stating: ‘anyone who is of the belief that ladies should not enjoy their social rights, cannot be considered to be an enlightened or freedom-loving person….’ It also contacted women’s organizations, including the Ladies’ Centre – Women of the Party of Iran, and requested their cooperation and participation in a rally aimed at fighting for “the right to vote and the right to be elected.” At this time, Women’s World was published daily as a single sheet and it helped follow through the mobilisation for regional demonstrations (in most of which women were subjected to violence). However, the new constitution continued to deny women these rights. In a telegram to the United Nations, the Women’s Organization protested against the new electoral law, which breached the United Nations Charter and the Universal Declaration of Human Rights. In the Congress of the Women’s Organisation of Iran which was held in 1953, more than 300 women delegates from across the country participated. The congress which was held in a garden in the countryside, under the guise of a wedding celebration, because the authorities had not issued a permit for holding it, issues related to women’s rights, civil rights and women’s political and economic rights were debated. The congress passed a resolution, the most significant part of which was the demand for women’s right to vote and to stand for election. The proceedings elected representatives to attend the World Congress of Women due to be held in Copenhagen (1954) organized by Women’s International Democratic Federation (WIDF). During its clandestine activities, in the year 1951, the organization brought together mothers in organisations called ‘Mothers’ Councils’ in order to organise its neighbourhood activities and struggle. These councils took petitions to the government ministries and offices, regarding local matters that affected the ordinary people, such as the situation of families and local problems, such as the need for schools in the area, road surfaces, access to electricity and the like. The Mother’s Council had many successes, especially in working-class areas where many women had gathered around its activities. Another of the activities of the Democratic Organisation of Iranian Women was the struggle for world-wide peace, and one of the brilliant campaigns that could be mentioned was the collection of signatures under the Stockholm Peace Declaration. A young girl who had been able to collect thousands of signatures for the Peace Declaration, with the Organization’s support, won a Peace Prize. The Society for the Protection of the Child, which was founded with inspiration from the WIDF was another initiative of the democratic organization of women in Iran. The Organisation exposed, in a publication, the hard life the Iranian children led, labouring for no pay, in damp carpet weaving workshops and factories, and the absence of educational opportunities for rural children, and highlighted their poverty and high death rate. The activities of the Women’s Organization of Iran were halted by the coup d’état of August 19, 1953, when the office of the organization was occupied by soldiers and its publications were banned. Thus, the organizations of Iranian women, who had been tirelessly pursuing their efforts to organize and awaken and raise the level of awareness among women, were announced illegal. Following the coup d’état, a large number of militant and progressive women, along with other Iranian freedom fighters, were arrested and imprisoned, and some were forced into exile. In forced exile, too, the women of Democratic Organisation of Iranian Women continued their struggle, by participating in international conferences such as the Mexico Conference and the World Congress of Women, where they gave speeches and presentation, and made public knowledge the suffering of women in Iran, alongside contributing material in the publications of the Tudeh Party of Iran. Women like Malakeh Mohammadi, Maryam Firouz, Aliyeh Marami, Homa Houshmand Raad … who found themselves in unwanted exile continued the struggle in other ways while raising their level of knowledge. During the same period, the coup d’état regime proceeded to manufacture state-sponsored parties and organisations in an attempt to replace the progressive organizations and parties. It used every means at its disposal to direct the struggle of women for their social rights into one of charitable work. In this regard the state created the “Supreme Council of Women” under the leadership of Ashraf Pahlavi, the Shah’s older sister. Massive protests of women that ensued forced the council to be dissolved in 1966 when a new organization, known as the Women’s Organization (Sazeman-e-Zanan) was launced. At the same time, the reactionary regime of the Shah abolished some of the gains that women had made through their persistent struggle. Typically, the 12-week maternity leave, which the government of the time had been forced to ratify, was reduced to 10 weeks in 1958, and the issue of equal pay was abandoned. Later, under pressure resulting from global and domestic conditions, the Shah’s dictatorial regime gave in to some of the demands of women, including women’s right to vote, as well as minor changes to civil law, in particular the Family Protection Bill, some clauses in which were moderated, such as the right to divorce and custody of children. These latter gains were later reversed by the misogynistic regime of Velayat-e faqhih as being un-Islamic. With the 1979 national democratic Revolution of Iran, Democratic Organisation of Iranian Women resumed its open activity, albeit briefly. It rebuilt its women’s organizations, started various educational classes and re-established its links, and later helped in the efforts to defend the national sovereignty, helping the wounded during the (Iran-Iraq war). As DOIW resumed its activity on the ground, it also resumed that publication of Women’s World magazine which enjoyed high circulation. The organization had spectacular success in attracting a wide spectrum of women into its organizations and this led to becoming a target for the regime as it embarked on the suppression of progressive forces, as the war raged on the country’s south-western border. In 1983, the Organisation’s office in Tehran was shut down and its publication was closed down by the regime. Maryam Firouz and many activists were arrested and were subjected to the most brutal torture in prisons. Some others were forced into exile, but the struggle is still ongoing in various ways in the pursuit of women’s rights. The Democratic Organization of Iranian Women was suppressed, but the regime did not succeed in destroying it. The seeds that were sown, and the rich experience of political activism and trade unionism among women and the variety of forms of struggle was passed on to the next generations. The generation that is now challenging the Velayat-e faqhih regime in Iran with new initiatives, and alongside the people’s struggle rejects this reactionary regime, and fights to abolish the medieval laws that have reduced women to second-class citizens. It fights to eliminate gender discrimination. At present, the struggle for women’s rights falls fully within the framework of the struggle against the Velayat-e faqhih regime as the main obstacle to the advancement of society, and every success in the women’s movement benefits the broader struggle against dictatorship and reaction. For this reason, the independent women’s movement in Iran is an important and indispensable part of the popular movement to reject the regime of Velayat-e faqih, to achieve freedom, social justice, and for the elimination of sexual and class discrimination. The Democratic Organization of Iranian Women, Iran’s largest progressive women’s organization, was founded on 18th February 1943, by a group of women activists from the ranks of the Tudeh Party of Iran.